Alley Spring Mill is located in Shannon County in south central Missouri. Archaeological evidence suggests that Native Americans camped throughout the Alley Spring area ten thousand years ago because of its abundance of fresh water and game. European homesteaders began arriving in this area in the 1830s and 1840s, forming a settlement along the Jacks Fork River. The first mill was built in 1868. The Alley Spring community was originally named Mammoth Spring and later Barksdale Spring, but these names were deemed too long by the Post Office, causing the village to once again rename itself, this time after a prominent local citizen with a modestly shorter name, John Alley. From that day to this, the village is officially designated Alley Spring but the area has been known as Alley Spring Mill, Alley Spring, Alley Mill, or Alley. 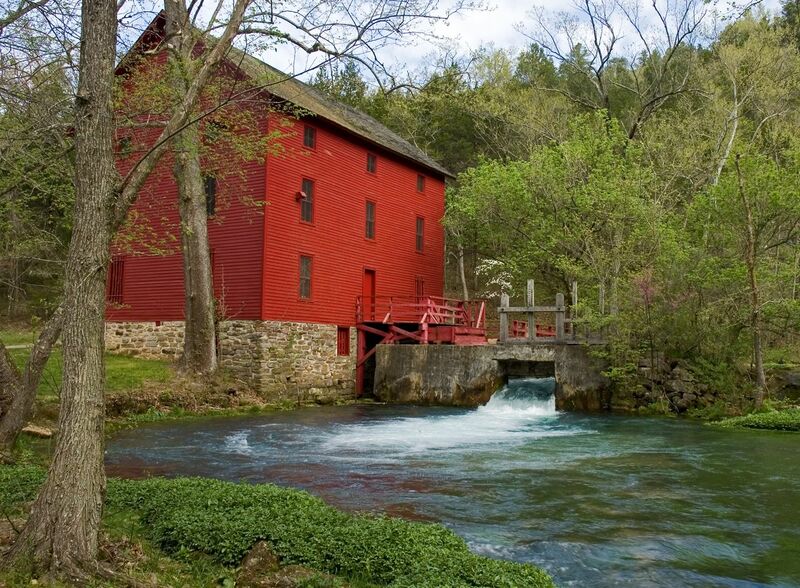 In 1894, the current Alley Mill was built by a local speculator, George Washington McCaskill, using the latest technology – a turbine rather than a water wheel and rollers rather than stone grist stones. The community at Alley thrived initially, serving as the venue for dances, baseball games, and roller skating. John Knotts purchased the 80 acre site in 1902 and opened other enterprises near the mill, including a well-stocked store and blacksmith shop. The milling operation itself was expanded to include corn meal production as well as flour. Alley’s school in 1903 had an enrollment of 42 students. Church services were also held at the schoolhouse. Conrad Hug became the new owner in 1912, and made Alley one of Missouri’s first resorts, known as Crystal Spring Town Site, attracting people who came by train from as far away as Saint Louis. Glider swings for tourists were scattered around the spring and July Fourth was one of many festive celebrations. Prohibition doomed the economic success of this resort. Today, the mill is operated as a an educational site. This tributary of the Current River is one of the wildest and most scenic of the Missouri Ozark streams. Its deep valley is nearly a canyon, with no bottomland fields for the first 25 floatable miles. Both the Current and Jacks Fork Rivers wind through a landscape of rugged hills and towering bluffs, making them especially scenic and satisfying routes for canoe and float trips lasting from a few hours to a few days. The general character of the river is narrow, swift, shallow gravel- bottomed rapids, alternating with deep, calm pools. It is much like floating down a winding, watery stairway as you canoe downstream through this verdant river valley. The average canoeing time is 3 miles per hour. Water temperature ranges between a cool 58 and 68 degrees year around. The canoeing difficulty is rated a Class I (easy) with occasional Class II (medium) sections. The Jacks Fork River drains directly into the Current River. The Jacks Fork River is formed by the confluence of two streams: the North Prong and South Prong of the Jacks Fork. Both streams join to form the Jacks Fork River northwest of Mountain View, Missouri. From this point, the Jacks Fork flows in an easterly direction for 49.1 miles before joining the Current River northeast of Eminence, Missouri with an average gradient of 7.1 feet/mile. There are 22 officially recognized springs within the Jacks Fork River watershed. However preliminary results of surveys performed within National Park Service boundaries indicate that many more springs exist within the watershed. Alley Spring is the largest spring within the watershed with an average discharge of 125 cubic feet per second or 81 million gallons a day. The spring basin is funnel-shaped with a depth of 32 feet.